Practice Areas: Liability Claims (in particular Third Party, Employer’s Liability, and Product Liability), Environmental claims, Mass Tort, Class Actions in the Oil and Gas fields, and Jeweler’s Block Policies. Sharon worked for several months during her training period in the London Market, and has served this market and the German market since 1997. 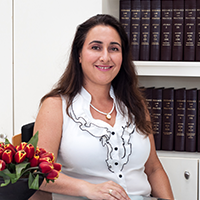 Education: After graduating from the Tel Aviv University, Sharon successfully completed her LLM in a combined program for commercial law run by the Tel Aviv and Berkley University in California. Status: Sharon heads the Jewelers’ Block Insurance Department and the Energy, Oil and Gas Department. Sharon currently acts for Insurers of the oil and gas industry in some of the largest claims submitted in Israel, mainly gas explosions, accidents etc. Membership: A member of the Israel Bar Association, the International Bar Association, member also of the Israeli Triathlon Union. FAILURE TO COMPLY WITH MEASURES TO REDUCE THE RISK, WILL INSURERS BE EXEMPT FROM LIABILITY?